Such a tank doesn't fill on it's own, does it? Propane is not sustainable nor renewable fuel. While you can produce methane (the main component of natural gas) from biomass, there’s no easy way to produce propane from wood or waste and no-one does that. In theory, you could produce propane and buthane from producer gas (synthesis gas) using Fischer-Tropsch process, but there’s no need to do that. We get enough propane and buthane when mining crude oil and natural gas. There’s no easy way to substitute natural gas as an energy source. Most of it we use to heat our homes, produce domestic hot water and cook meals. In european climates it’s almost impossible to heat a house without using a external heat source. The only possibilities are to use energy from wind turbine to power electric heaters, burn wood in furnace or store heat accumulated in summer. Passive solar heating is not enough, even passive houses must have (small) heat source. I don’t think that using propane is should be considered as a energy source for the period of transition from typical household to off-grid homestead. In Poland the only people who choose to heat their homes with propane are the people who will be connected to gas supply network in a couple of years. Propane is even more expensive in Poland than off-peak electricity! Because of that, the people buy gas boilers and large propane tanks only when they know than in a few years from then they will be able to use much less expensive natural gas. I only think it’s justified to use propane for cooking. It’s of course possible to cook on a wood stove, our grandmothers did that for centuries, but it’s much easier to cook a meal on a gas burner than on a woodstove. I would recommend to have a wood stove in a kitchen though, even if you don’t want to use it at all! 3 Responses for "Using propane is not off-grid!" I can’t agree with you on this. Because propane has nothing to do with electric. Off-the-grid means you are off the utility grid. 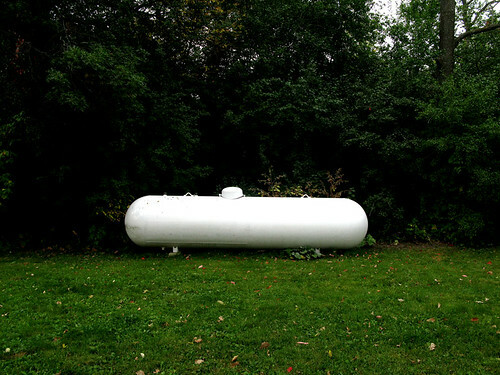 Propane is a fuel, much like the gasoline you purchase for your vehicle. I have seen many people have this idea. They think if you are using the internet you are not off-the-grid either. Or if you are buying food from the store, you are not off-the-grid either. None of them have anything to do with the utility grid, which is the wires that go to the houses to hook them up. Well… I guess it depends on your view point. If you want to be off-grid to be self-sufficient, independent from any external energy suppply, then you should not rely on propane or any other non-renewable fuel you have to get somewhere. If you just don’t want to pay electric bills, but need nothing more, then you can get a generator, fuel it with propane, diesel, gasoline, or anything else. You could even be using natural gas from gas distribution system. But what is the point in this case? I always viewed being off-grid as being independent, free and safe from disruptions in power/gas supply. If the safety and independence is the goal, one should not rely on propane, coal, natural gas or gasoline, to the extent possible.